A gender reveal is now a big deal, but this couple took it to a whole new level. Keri Lumm reports. When it came time to reveal the gender of their unborn child, sports fanatics Gus and Cynthia Forward didn’t feel like throwing a powder-filled baseball into the grandfather’sface or asking Bill Murray to smack an exploding golf ball. And yet, even without any of that, they still managed to pull off one of the greatest announcements the (fake) sporting world has ever seen. 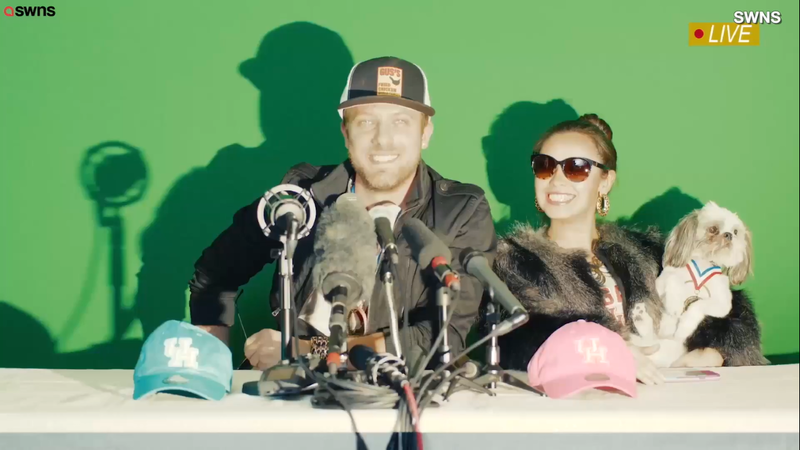 Gus and Cynthia – who met at the University of Houston and now live in Clearlake, Houston – staged an elaborate fake press conference to reveal their pick for the “Forward Baby Draft 2019,” complete with fake photographers and a table full of microphones. “Today is not about me. It’s about the future of this great franchise,” Gus states, while sitting in front of one pink and one blue University of Houston baseball cap. Cynthia, sitting beside Gus, hilariously busies herself by taking selfies and tending to the pair’s dog. “Without further ado, the Forward Franchise proudly selects Michael Alexander Forward to lead us into the future,” Gus says, picking up the blue University of Houston hat and placing it atop his head.